No matter what time of year it is, celebrities like Angelina Jolie, Miranda Kerr, Jennifer Aniston and Tyra Banks always manage to maintain good-looking, healthy hair. During these cooler days, you may have found that your hair isn’t in the condition you would like it to be; so eating a healthy diet, full of nutrients and vitamins, is the best way to keep your hair and skin looking and feeling healthy. To ensure your diet remains healthy, there are a number of vitamins that are absolutely necessary to giving your hair (and body) the nutrition it needs. One of the most important vitamins needed to achieve strong and healthy hair. It’s the vitamin that does the most work. It strengthens and thickens your hair, allowing it to grow longer and prevents it from breaking as often. Ensuring you get enough of this helps reduce hair loss and slows the greying process. It also speeds up hair growth and gives it more shine. Vitamin E is an essential part of your diet. It helps blood circulation, leading to a healthier scalp. If you have curly hair, this will help you reduce frizz and achieve a gorgeous head of curls. 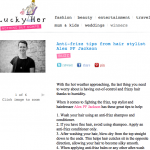 La Biosthetiuqe Anti-frizz tips from hair stylist Alex PF Jackson How to create beachy waves.